Does anyone have some info for this year's NewVape sales? I'm still very new to the whole vaping thing. But I do like the looks and fiddling possibilities of the Flowerpot. So I would be interested in a Shower head full package. So far I got myself an MV1 and thanks to @Baron23 (for post's and advice to others) I invested in a CloudEVO. 20% and on 4/20 is what I've read so far. Thank you for the info. Might have to plunder the piggybank! 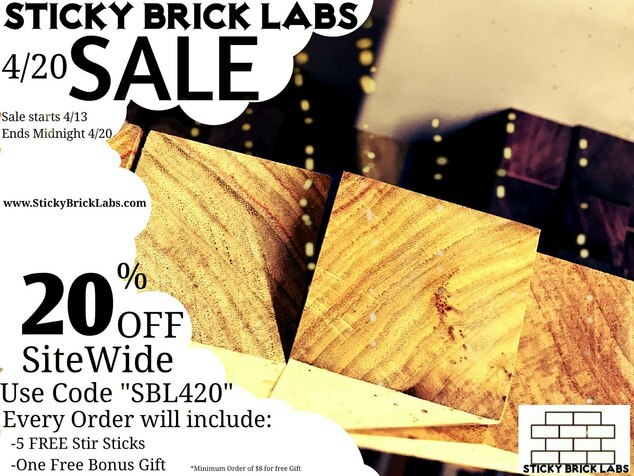 stickybricklabs.com sale info should be going up soon, possibly today. there's currently 30% of $300 spend at 7th floor vapes if that's of any interest to anyone. Apparently Vapefiend.co.uk will also be doing the 20% off Dynavap for the same dates, unconfirmed yet though. @Cl4ud3 great scoops on the UK sites, good work! "Good morning and thank you very much for your interest in our products. I'll give you a heads up and let you know that we will be having a 420 sale that will offer a significant discount. We are still working out the details, but it will happen..."
Happy 4/20 everyone! Sale starts tomorrow! Sneaky Pete has a bunch of really awesome deals based on the manufacturer. I ended up picking up the Sticky Brick OG plus some extras for 25% off with free shipping and some freebies! 20% off and free shipping will be the Dynavap sale!! Awesomeness!!! Need IH info too! The sale will start tonight but the exotics will not be listed until later this weekend! If you go to the planet of the vapes site, they have a page that covers the 4/20 deals on a number of other online sites. It is not 100% complete, but has a lot of sites covered. 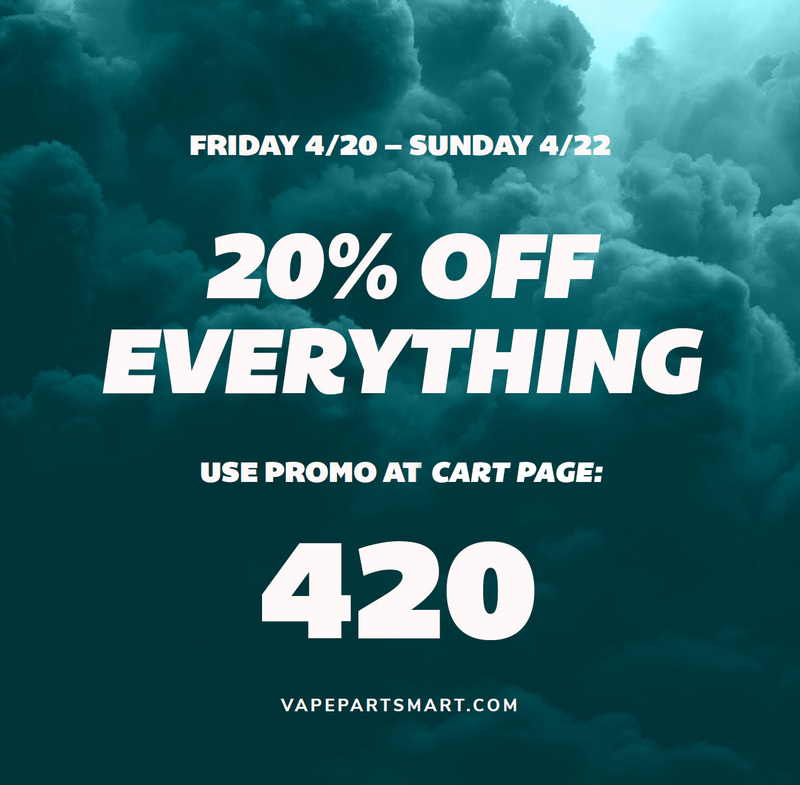 Vape Parts Mart will have a 20% off 420 weekend sale Friday through Sunday. Happy 420! Enter code 420 on the "cart" page. Hi Nathan and thank you! I hope you’re managing to have lots of fun on your trip to China.... even though something tells me you’re probably not finding that at all difficult...! Would you by any chance happen to have any idea at all when the CCell Silo batteries will be made available? I’d really love to give you my money...! High everyone! Thanks to Bud for allowing us to join the forum. Our 420 sale is active until midnight on 4/20. 20% off our full catalog. No coupon code needed. The discount is automatically applied in the shopping cart. If you haven't tried our PUFF MAJIC e-liquid mixer or our SYNERGIC terpene mixer then now's a great time. Visit our new website at www.MAJIC.solutions to browse our selection and email if you have any questions. Our staff is always happy to answer your questions. If you are a new customer, don't forget to register. Our new MVP rewards program is a great way to earn discounts on future orders! Thanks and Happy 420 to all. Sorry but Vapefiend is to overpriced! Looked at the Flowerpot and they want around 1100 Au$. At NewVape its around 850Au$. Even with freight it's cheaper coming from the US. Does anyone knows about vaposhop.com if they have sales?